Patrick Mahomes II was a popular name heading into his NFL career with the Kansas City Chiefs, but success did not happen overnight. Instead, it took about a year for Mahomes and the many Patrick Mahomes rookie cards to ascend to the top of the sporting world (and hobby). The exciting quarterback spent most of his rookie season on the bench, but when given his chance to run the show, he proved to be quite a young talent. In fact, Mahomes began his first full season as a starter at a record pace. This, in turn, has made the values for Patrick Mahomes cards explode in a hurry. Shop for high-end Patrick Mahomes cards on eBay. As his NFL career got underway in 2017, the Patrick Mahomes rookie cards came in 2017 Football Sets, and there are plenty of choices. These tend to be his most popular, but all Patrick Mahomes autographs see considerable interest, as well. 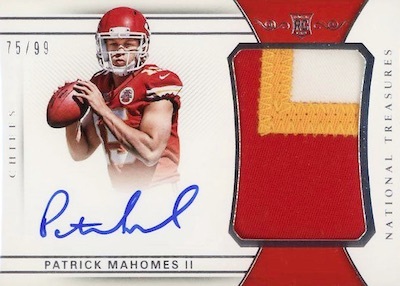 High-end Patrick Mahomes football cards from 2017 Flawless and 2017 National Treasures usually produce the biggest values, but his 2017 Contenders Rookie Ticket is arguably the top overall option for many collectors. Cards from these sets have regularly sold for thousands. 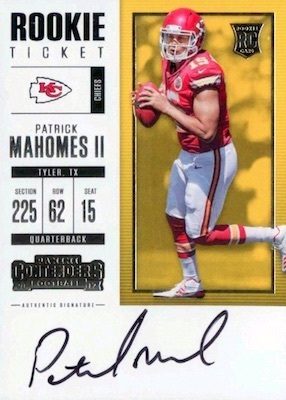 Of course, there are options for every budget, so don't get too depressed when you see the high prices that some of the top Patrick Mahomes football cards command. See also: Top Patrick Mahomes Rookie Cards List. Because of his early success, Patrick Mahomes is also a regular guest on our overall sports card hot list. If you are looking to see the top Patrick Mahomes cards out there, this is the place to be. Updated in real-time, the list below highlights the most-watched card auctions for Mahomes on eBay. For further details about any card, simply click on the link(s) below. Click to see the current Patrick Mahomes auctions with the most bids. 2017 PATRICK MAHOMES IMPECCABLE ELEGANCE RC ROOKIE HELMET PATCH AUTO /75 INVEST! 2017 Patrick Mahomes Gold Standard rookie patch auto 1 1 BGS 9 10 White Ink!